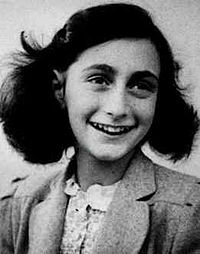 On August 4, 1944, Anne Frank was arrested. What crime did she commit? Basically Anne Frank and her family were born Jewish. This was the primer for my middle school history class. I sat in slack jawed disbelief as the teacher continued to speak of the holocaust and the basic genocide of the Jewish people. I am trying to remember how but I know that we did as a class, read the diary of Anne Frank. The diary of Anne Frank is a wonderful book. The book has been made into plays and has been read in some shape or fashion by middle school classes all over the western world. I think we read the book out loud, still not sure. The diary is written by Anne Frank and is from the time she and her family spent hiding from the Nazis. Just last year my daughter Hannah read the book for school and I was pleased. Not so much because of its historical value (although history is important, those who do not know or learn from history are doomed to repeat it) but more for the inspirational effect the book seems to have. This young girl Anne is in exile living on a razors edge and her diary is full of these beautiful reflections on life and the power of living. The world can be a dark and scary place. Our kids will grow to be adults and then will face this world the way we all do. Alone. This is a thought that can keep parents awake at night. Your child will face what you have faced are facing and will face and they will do it alone. Junior cannot bring you with him or her to college, his or her first job interview or on dates. Most likely junior will experience all these things and while these are fun great things they can also be stressful and scary and dangerous. What is a parent to do? What can we teach them that will work today and tomorrow. What tool can we give them that us universal. No matter where they are. I think Anne Frank gave it to us all. Optimism and compassion are tools, when employed properly that, can change the world! It is amazing how much parents can learn from a 16 year old girl!